﻿ Welcome to Dag Kihlman's homepage! 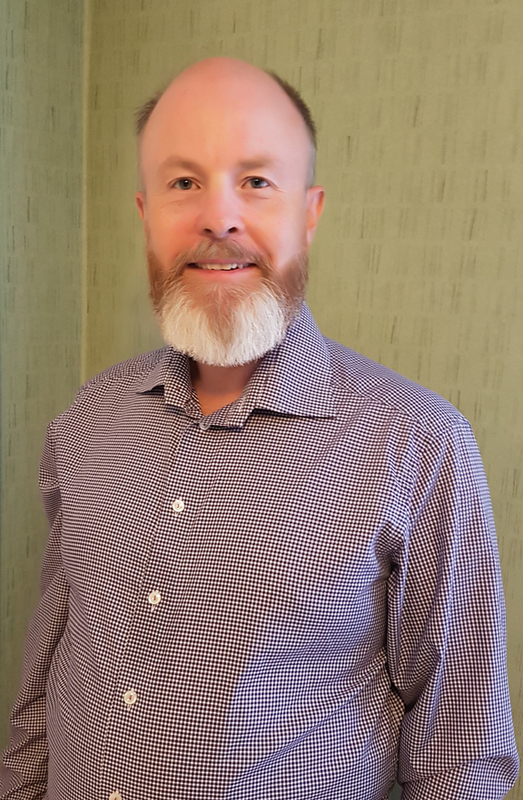 I am a 49 year IT-consultant and estate owner from Trollhättan in Sweden. I am the owner of Trollhättehem and Infomacro. I have done these pages primarily to gather my links. I have been programming since upper senior high school, which means I am acquainted to a number of programming languages: Basic, Visual Basic, PERL, Java, Java Script, PHP, Visual Basic .net and C#. In my spare time I enjoy walking in the forest, training and going to good pubs. I have for several years taken part of a cooking course focused on classical dishes. Another interest is attending different orders and societies, such as Odd Fellows, Götiska Förbundet, Par Bricole and Rotary. 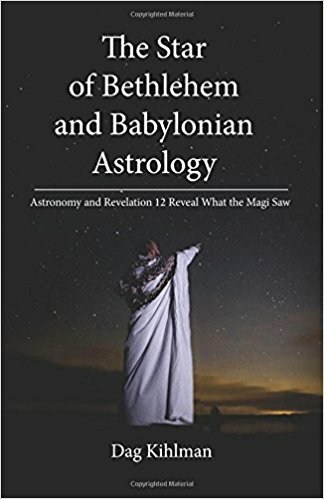 I have written three books: Programmering för Internet (Programming for Internet), Programmering med Visual Basic .net (Programming with Visual Basic .net) and The Star of Bethlehem and Babylonian Astrology. I have heard that my programming books often are used as quick desktop references, which is exactly what they are made to be. I believe that the Internet has changed our way of reading. We do not read from cover to cover. Rather we rapidly want to extract information. That is why I have put a lot of effort on the registry, internal references and index. My speciality is doing graphical interfaces to databases. It could be a standard window application or an interface on the Internet. The most familiar window applications are Word and Internet Explorer. A window application is often the most secure way of working with a companies information. I do Internet and web applications. An Internet application is less secure, but reachable from anywhere. A common mistake is to make the pages too rich in information whithout proper resources to update the information. Keep it simple is often a good rule of thumb. Many companies and organizations have a lot of data in Excel and other databases. Often the data is manipulated and copied manually. This leads to heave work load and errors. I can make programmes that automate boring and time consuming tasks. Kihlman's SQL is a tutorial programme about the database language SQL. Wordbase Greek is a dictionary, text editor, flash card and hangman game primarily focused on ancient Greek. 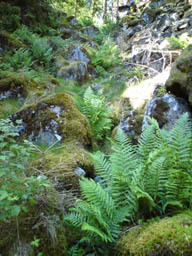 I enjoy walking in nature, especially wild nature. 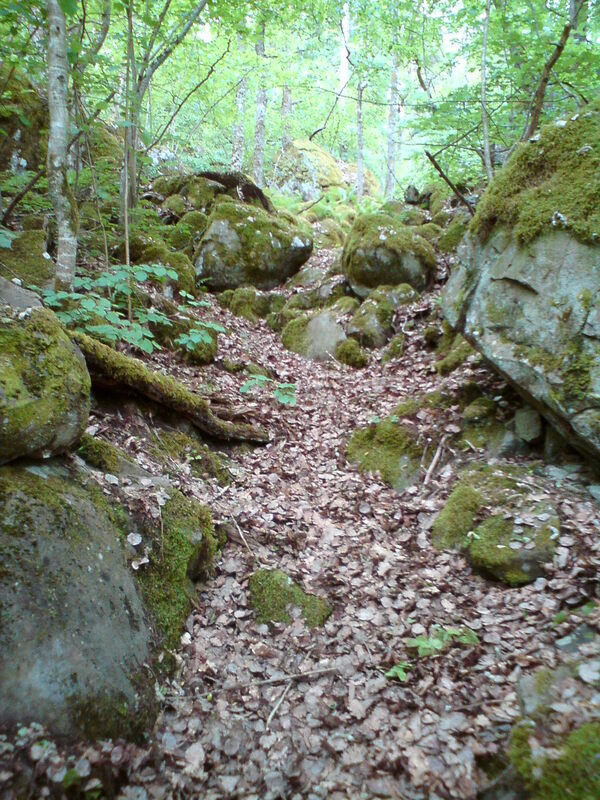 I mainly walk at Halle- and Hunneberg, west of Trollhättan. But I also walk in some areas close to Uddevalla. These two mountatins are to some extent protected by law. The mountains are so called plateau mountaints, which means they rise up sharply from the surrounding plains. It is only possible to come up at the mountains at certain places, so called Klevs. Below are descriptions and photos of all the klevs I have visited. They are numbered from Nordkroken, north of Vargön, to the south along the west sides of Halle and Hunneberg. Then the numbering goes around Hunneberg to the east, to the north and then to the west, between the mountaions. Then ne numering continues on the north side of the valley, i.e. 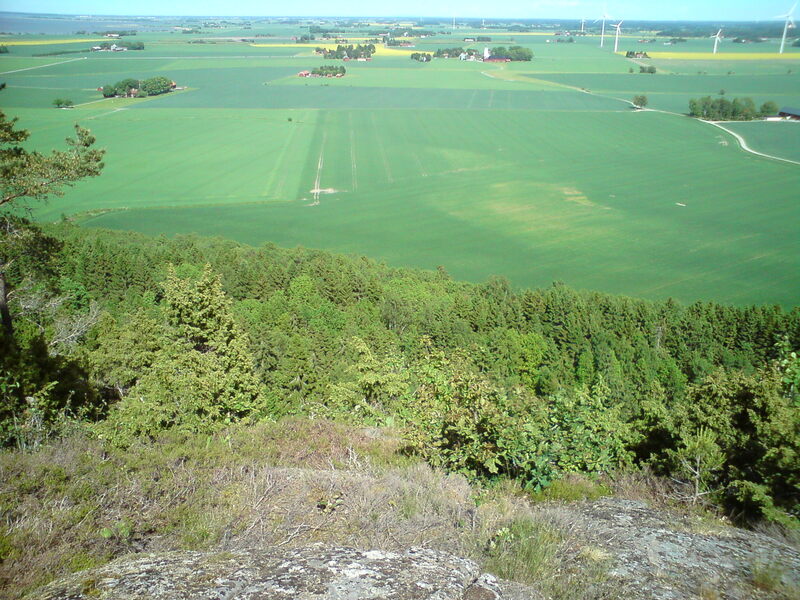 the south side of Halleberg, goes to the east, north and then roounds the norhern part of Halleberg. 1. 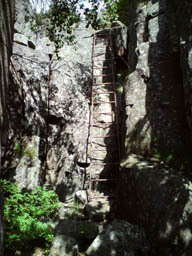 Snugge klev N58°22'47.52" E12°25'01.03"
This track on the north west part of Halleberg has three ladders. 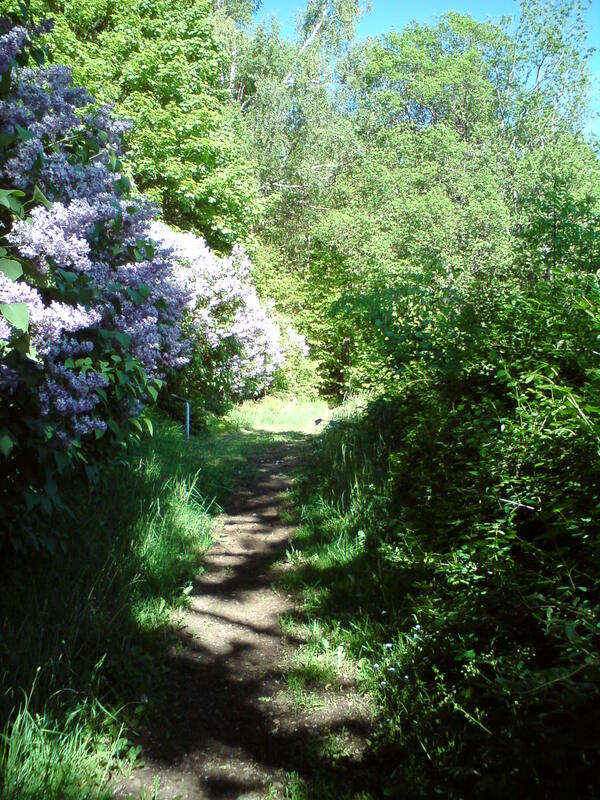 It is a very nice walk. 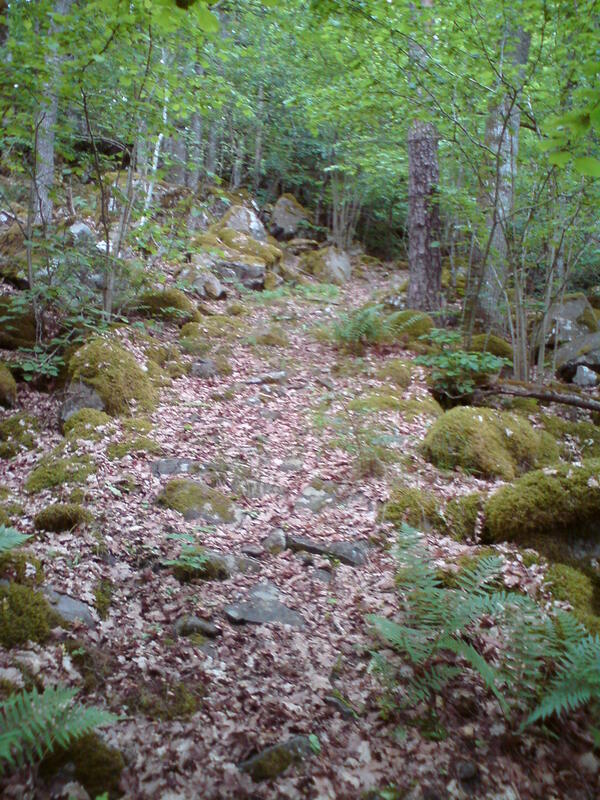 You reach it by walking on Halleberg, pass Uggledalen north and after 700 m take left at the sign Brudslöjan. 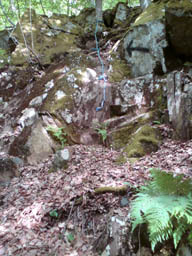 When you see the waterfall, follow orange markings until you find the track down. 2. Putte klev N58°22'45.20" E12°25'01.03"
What a klev! It is only possible to go down since you will have to jump at some places. You reach it by follow the path to Snugge klev, but when you come to the waterfall, keep close to it. At one point you will think you are stuck in the steep, but then go to the right and you will find a place to jump. 3. Lindås klev N58°22'27.28" E12°24'56.79"
This klev is situated on the west side of Halleberg. It is easy to walk, but it goes up all the time so it is really good exercise! You walk to it from Uggledalen on the mountain. 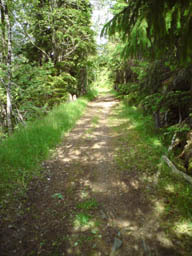 Shortly north of the Uggledalen cottage there is a wooden pole and a track to the left. That is one way. Another alternative is to take Skäcktefallet down and walk southwards along the side of Halleberg until You see a cottage. 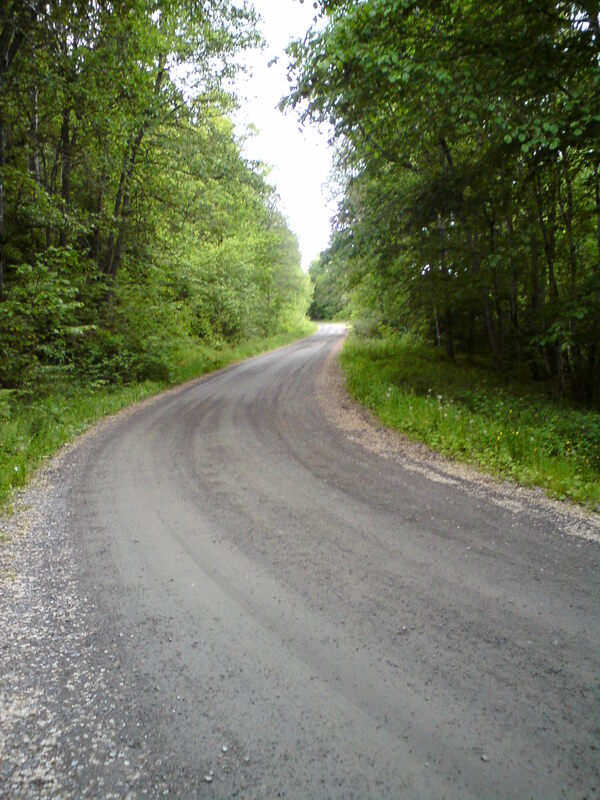 Take the road up to the cottage. The road continues as the track up. 4. 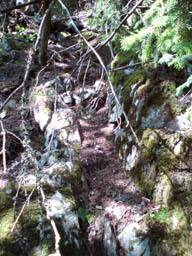 Björkås klev N58°21'48.97" E12°24'33.38"
This klev on the south west side of Halleberg is also called Björkås trappor. 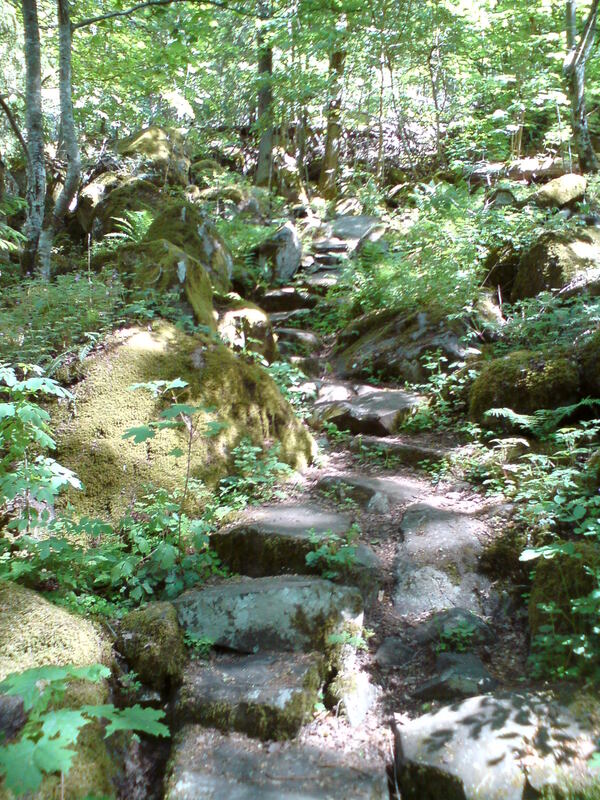 In the 1880:s mayor Sandberg had had the funny idea of making stairs (trappor) of the track. It is really anoying to walk on the stone stairs! 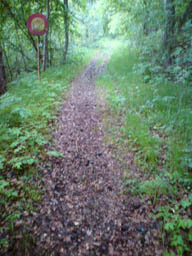 The track ends in Vargön and even if a popular map shows a track to Lindås klev I strongly advice You to walk up again. To walk in that part of Vargön is just boring. 5. 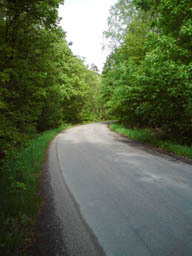 Storegårds klev N58°21'24.94" E12°24'52.92"
This klev is the only public road up to Halleberg. To the left of it is a nice valley to walk in. 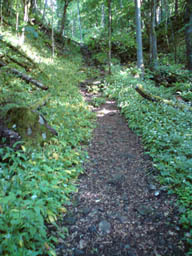 Do not miss the track to the wooden elk, which starts at the top of the klev! Hande Klev is a bit steep but still easy to go and not dangerous in any way. It begins at the south west corner of Halleberg and takes you up to Häcklan, a place with a good view over Hunneberg and down towards Trollhättan. To find the klev take the road from Vargön going to the valley between the mountains. 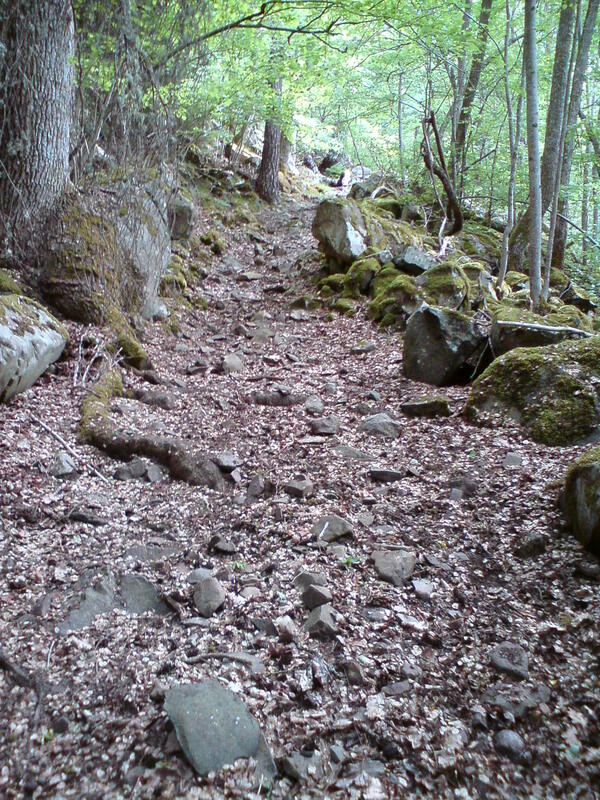 As soon as you have gone uphill and reach houses you have a way to the left going. Just a few meters after this crossing is a 2 meter high stone next to a couple of red houses. Park there and go the road left of the red houses towards the railwai and the mountain. As soon as you pass the railroad you have a red cottage to the left. 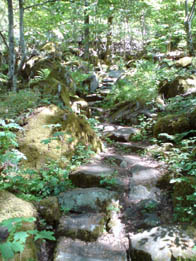 Go up on the mountain on the right side of the garden and walk left behind the garden and you will find a good path. 7. 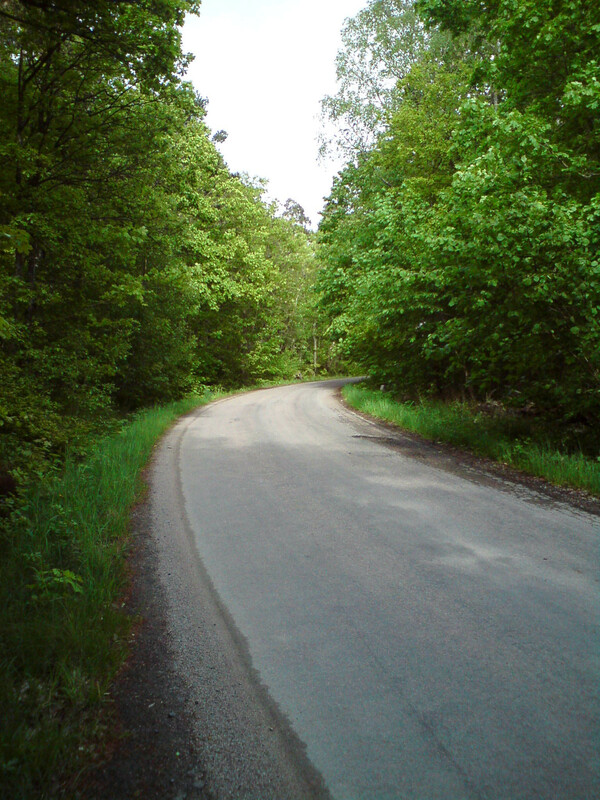 By klev N58°20'43.00" E12°24'53.70"
This klev is one of the three public roads up to Hunneberg. 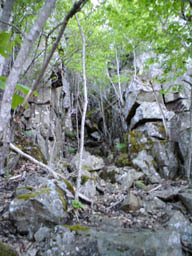 You find it on the north west corner of the mountain. Next to it is a beautiful waterfall, but the river is not natural. It is the result of a man made draining of a lake. 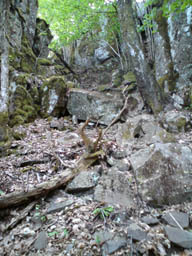 Forstena klev is called Forstena trappor, but i found only four stairs, so the word trappa (stair) is hardly appropiate. 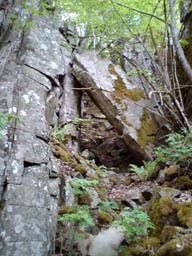 Göran Söderström says that one person has died in this klev, and that is why it is not marked. The klev is actually the steepest I have gone and you need a roap to get up. To find it drive to the north of Floget. 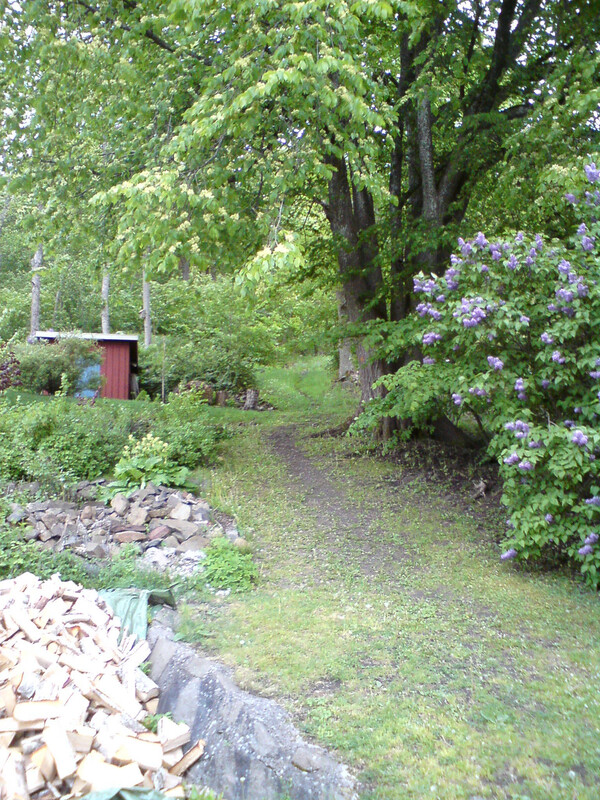 Park there and walk along the trail north behind Forstena. When you see a track to the left to the house, then walk 50 meters further and look for a black arrow pointing north west where the klev starts. Hol klev on the west side of Hunneberg is not much of a klev. 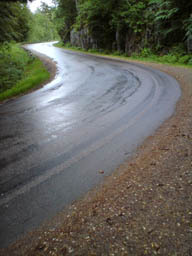 It is best described as a track going uphill. On the positive side it is easy to go and suitable for even small children. But look up for a big, dangerous hole next to the track! The track starts at Floget, a small area around the road north of Västra Tunhem church. It is difficult to park, so park att the Church, walk along the road and look at the beautiful houses. After house 460 take right. There is the track! Hol klev is best described as an uphill forest road. It is far to easy to walk for being called a klev. 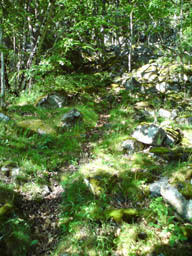 The track starts at Floget, a small area around the road north of Västra Tunhem church. Park att the Church, walk along the road and take right after house 404. There is the track! It goes up to a house. The track actually goes just a meter right of the house. 11. Präste klev N58°18'19.67" E12°24'40.02"
Präste klev is one of the three open roads up to the mountain. It is the main road up for people from Trollhättan. It has also been called Tunhems klev. 12. Mulltorps klev N58°17'55.87" E12°24'39.56"
This klev is a nice walk down from the west side of Hunneberg a short bit south of Präste klev. This is the suggested way to find it: Drive Prästeklev up and park at the first parking lot to the right. From there goes a path with red and yellow markings. Take yellow markings when the paths divide. After a while you will come to a place with a great view over Trollhättan and Vänersborg. Shortly after that is Mulltorps klev down with yellow or orange markings. 13. Hårrums klev N58°17'45.79" E12°24'43.96"
This is a smaller unmarked klev. 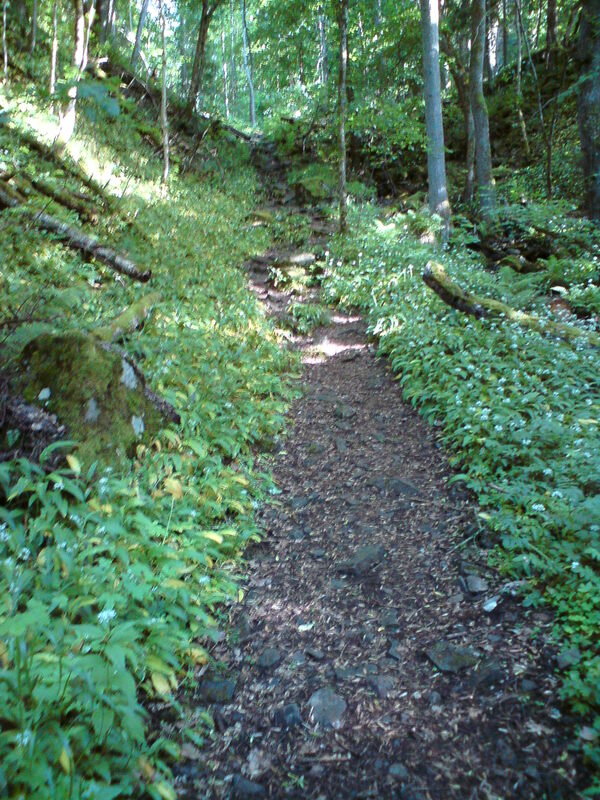 Follow the path to Mulltorps klev. After a while you will find a path to the right which is Hårrums klev. 14. 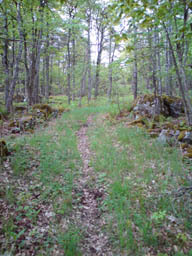 Trulsegårds klev N58°17'34.01" E12°25'05.13"
If you follow the path to Hårrums klev and continue a bit you will find this klev to the right. 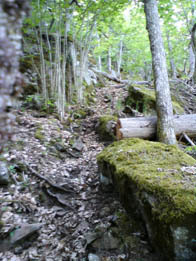 It is a good path, but at a certain point the track is difficult to follow. 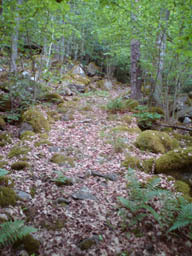 Göran Söderström, in his book Bergtagen, says the track turns into a creek. I say the correct path is 7 meters south of the creek, where there also is a border stone. 15. Fristorps klev N58°17'33.86" E12°25'18.57"
This klev begins at the same place as Store klev and is really easy to walk, but a bit tricky to follow. You find it by following the directions to Store klev (see below). Where the road ends there are some postboxes. Take right there and after just a few meters to the left. After a while you come to a man made road going to the right. Follow that fore a few meters and then take left, and left again after perhaps ten meters. 16. Store klev N58°17'29.14" E12°25'55.11"
This klev is on the southern part of Hunneberg. 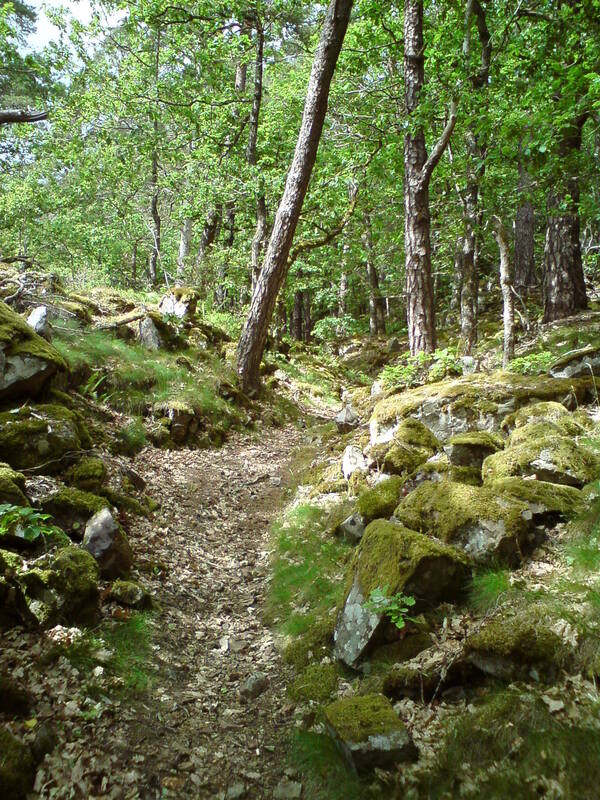 It is a nice walk in beautiful surroundings. The popular map of the mountains does not show the track correctly. It seems to start at the eastern end of the uphill road. Actually the track starts where the road turns east. The cottace Rosts backstuga is also at this place. 17. 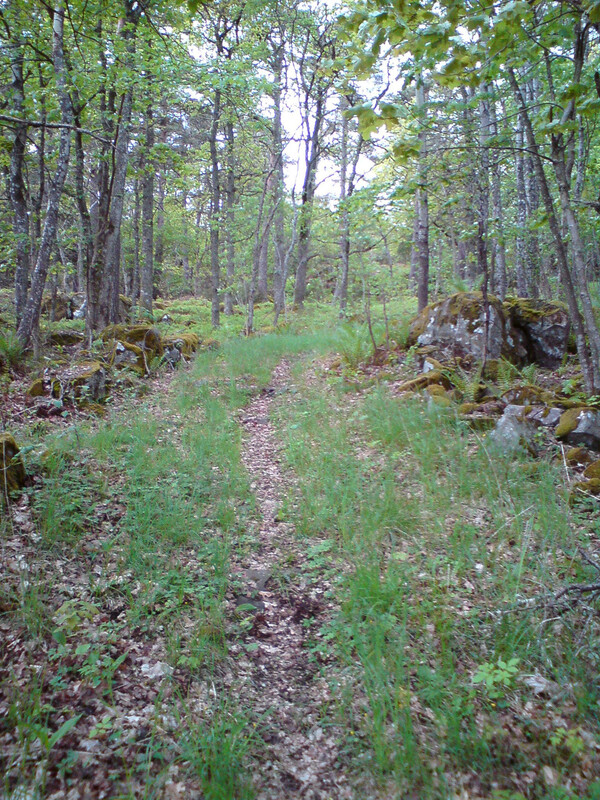 Skostorp klev N58°17'23.43" E12°26'19.67"
This is a poor klev and the track vanishes at the lower part. However it is easily found and easy to walk. Just take Store klev up until you reach a place where the track goes up to Fagerhult or east toKollidsvägen. 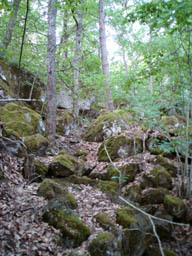 At this place walk south over the grass and between two rocks. There the track starts. 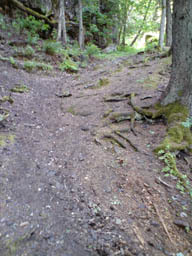 The track goes to a creek and passes it. This passage is easy to miss on the way up. 18. Börsle klev / Ramle klev / Östergårds klev N58°17'21.34" E12°27'05.09"
This klev's oldest name is Börsle klev. 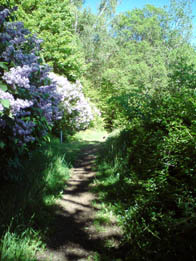 It is a steep but easily walked klev on the southern side of Hunneberg. To find it look for Klinten on a road. This is a small cottage below Ramle klint. Walk the road up to Klinten, but as soon as you pass a ditch take left and walk in the forrest up to the north east corner of the field. There a track starts. Walk this track about 400-500 meters west close to the fields. Then you will see the klev. When you are up you have a blue marked track to Ramle klint with a great view! 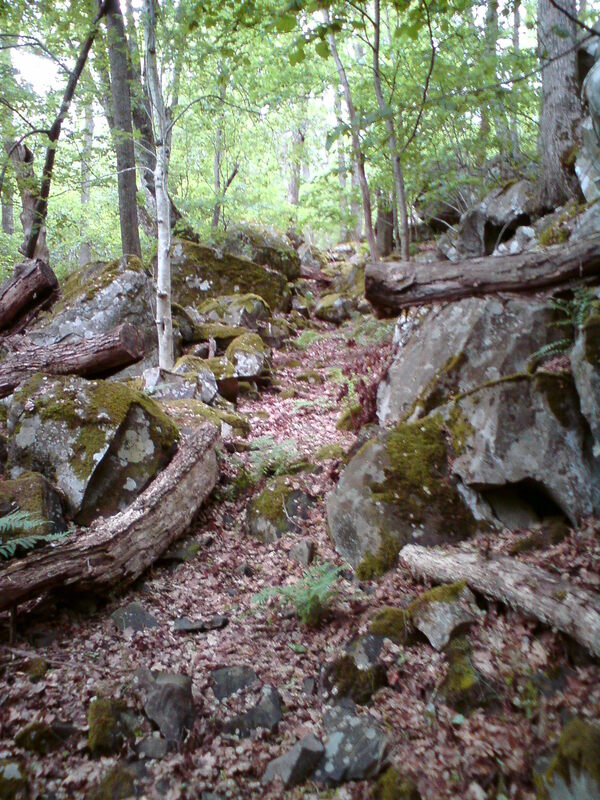 A shortcut is to walk up at N58°17'21.92" E12°27'37.38". It is not a klev but not climbing either. 19. Håsten klev N58°17'48.96" E12°29'33.87"
This klev is situated at the southern part of Hunneberg. 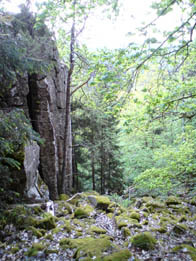 The klev is partly made by humans, as can be seen on the photo to the right. It is wide and not so steep. The original klev is easy to walk. If you come from the north do not turn west when you reach the edge but go a few meters to theeast and you will find the beginning of the klev. 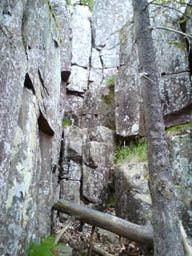 It is easiest to reach it from the top of the mountain, west of lake Kvarnsjön. 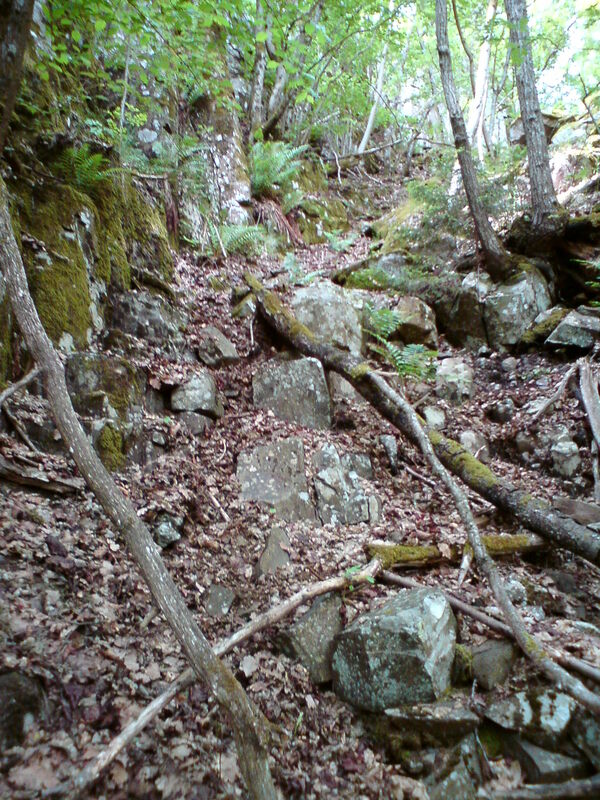 You could reach it from below, but it is tricky to find the track. 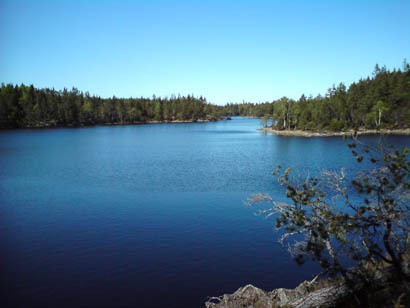 One alternative is to take Vågsäter klev up, make a walk on the mountain, pass Kvarnsjön and take Håsten klev down. 20. Vågsäter klev N58°18'06.42" E12°30'29.72"
This klev is situated at the southern part of Hunneberg. 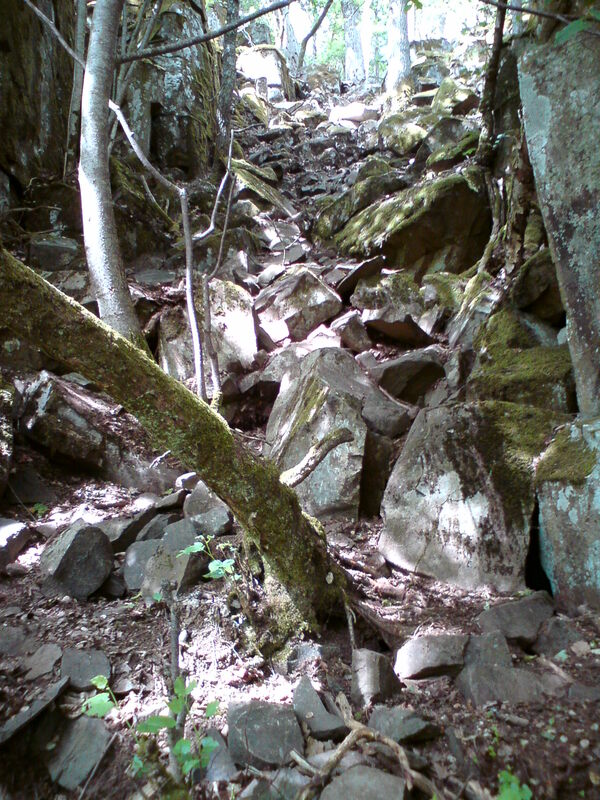 To me this is the most exciting klev since the path twists itself up between rocks and mountain walls. 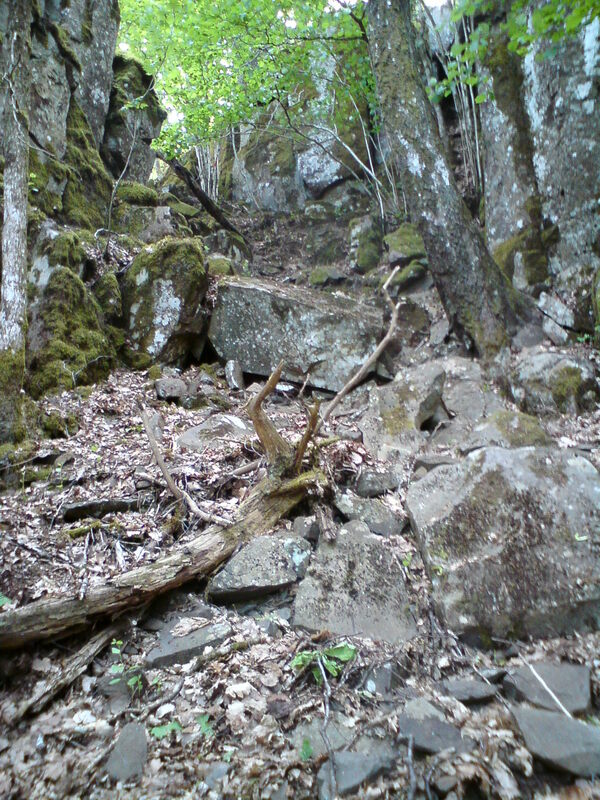 It is mainly natural, very steep and not for weak persons. The track actually goes under the 4m tall stone in the picture! Click at it for a larger view! 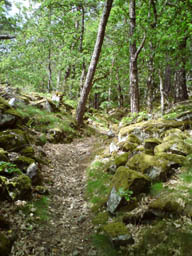 It can be reached from Vågsäter at the top of the mountain or from the small cottage Alvhem. The klev starts left of a cellar north of the farm house. It is difficult to find it, but look for the cellar! The cottage Alvhem is privately owned. It can be reached from national road 44. Take left where a sign to the right says Vittene. A better idea is to take right to Vittene and find a parkingplace, since it is not polite to park at the cottage. 21. 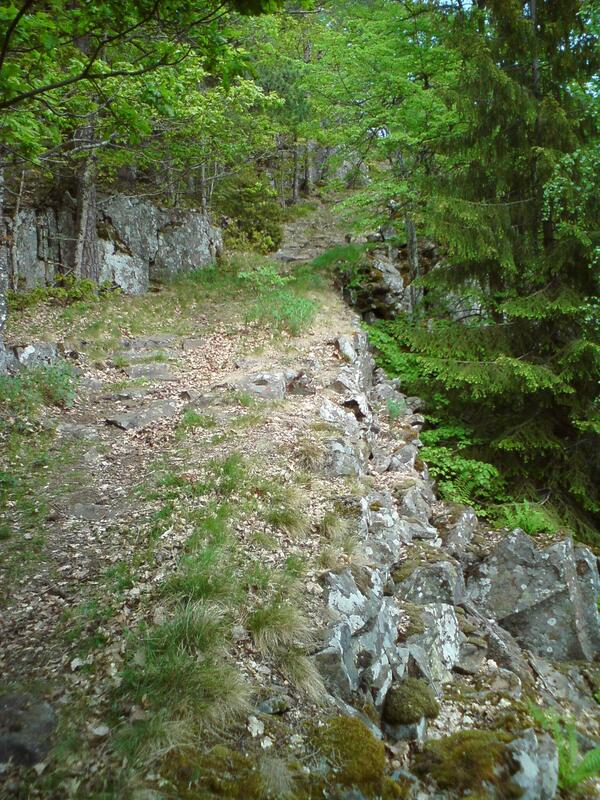 Vittur klev N58°18'12.29" E12°30'43.86"
If you just want to walk one klev - walk this one! It really has it all! You will see an iron gate from the 19th century. On the picture to the left You can see the gate if You look carefully. You will see magificent pillars of rock about five, six meters high. You will experience the narrow track but also the man made path upwards where once cattle walked. Since Vittur Klev and Vågsäter klev starts about 100 meters apart it is a good idea to walk both at the same time! 22. 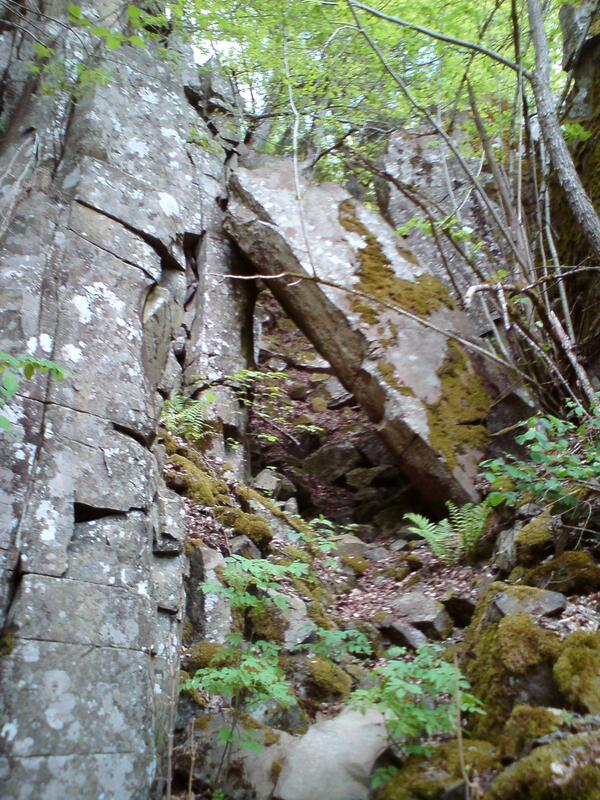 Röda slags klev N58°18'19.70" E12°30'59.46"
This klev is the most steep one I have found. You really need to use your hands in order to get up! I strongly suggest that no one attempts to walk down the klev. Have good shoes and choose a day when the track is dry! The klev is straight up from the first cottage east of Vittur klev. 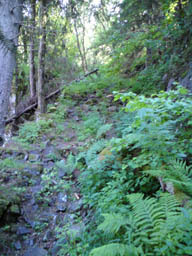 The track is difficult to discover, but go upwards and look for a creek, for the track is a creek too. The place was called Röda Slag reffering to a place where timber was thrown down from the mountain. 23. Dammsjö klevs N58°18'45.35" E12°31'37.01"
This klev is on the south east side of Hunneberg. 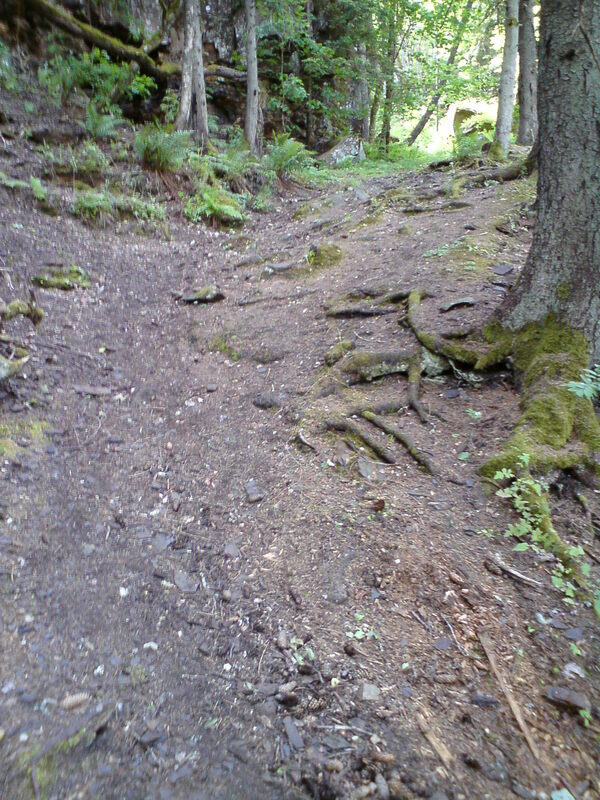 The klev has several tracks and is a nice walk. 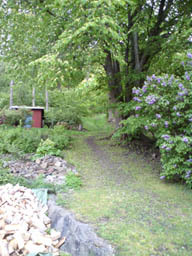 You find the klev by walking to the northern corner of Domsjön. From there try to walk straight east. It is just a matter of a couple of hundred meters. 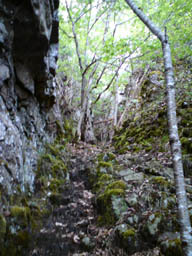 There are two main tracks. The southern one has best view over the plain. The northern track goes down to a cottage. 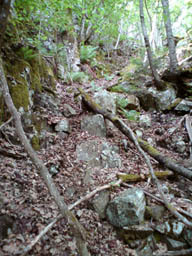 If You are at the cottage, walk southward close to the rocks and pass two stone walls and you will find the souther track. 24. Varg klev / Blomster klev N58°19'08.18" E12°31'55.24"
I stumbled on this klev when I was trying to reach Dammsjö klevar from Bragnum Klev. 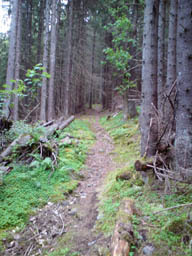 To reach it you follow the edge of Hunneberg until you reach a vally, which is the start of this klev. The picture really does not give the true feeling of the klev, even if it easily seen that the cliff is perhaps 15 meter high. The klev is actually very steep. The track goes to the right but turns left below the cliff. If you follow the track to the north you will end up at Bragnum klev. 25. Bragnum klev N58°19'21.10" E12°32'10.40"
This klev is on the eastern side of Hunneberg. It is easiest to reach it by driving to Flo church and from there take the road straight to Hunneberg. Pass a rune stone to the left and pass the house shortly after the rune stone. There, after the house the track starts. This klev is definitly not for weak persons and you need support of the hands. On the top you come to a very old oak. Take left there and you have a marvellous view over the plain. 26. Geta klev N58°19'29.88" E12°32'12.62"
Geta klev is a steep klev 300 meter north of Bragnum klev. It is easy to find from the top. 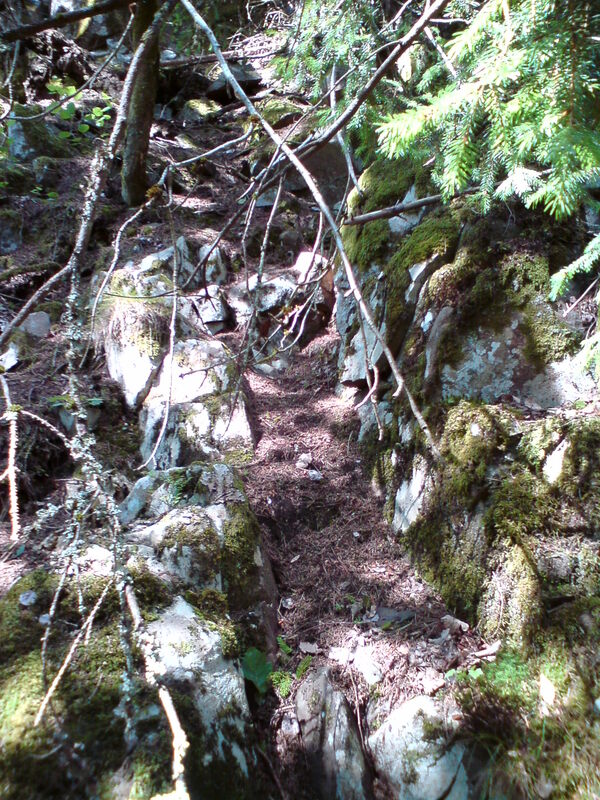 When you come down to a lot of boulders it is difficult to see the path, but walk on the side of the stony area and after 15 meters you will see a path of laid flat stones. 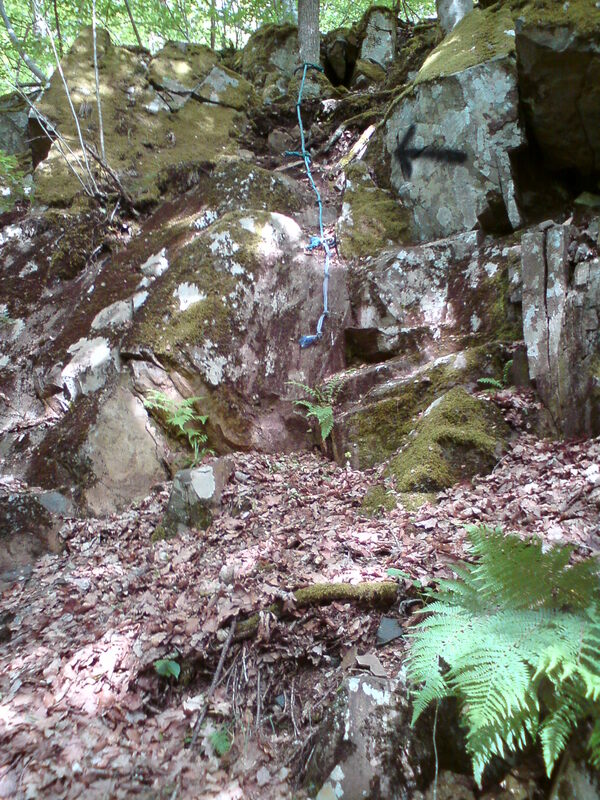 (N58°19'31.70" E12°32'14.77") Here is a picture of the stones. If you come from the plain, drive from Flo church towards Bragnum. When you are about 100 meters from the mountain you see a transformer. 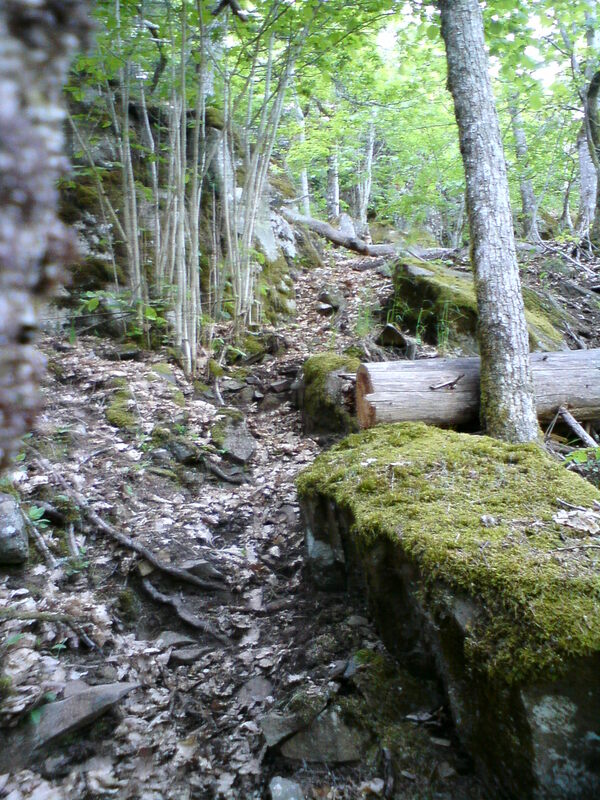 Take right there and the path begins 5 meters south of the house. 27. Västerby klev N58°20'21.99" E12°31'35.23"
Västerby was once the main road up from Flo. However the mining destroyed the klev and now you will have to walk on the ladder. 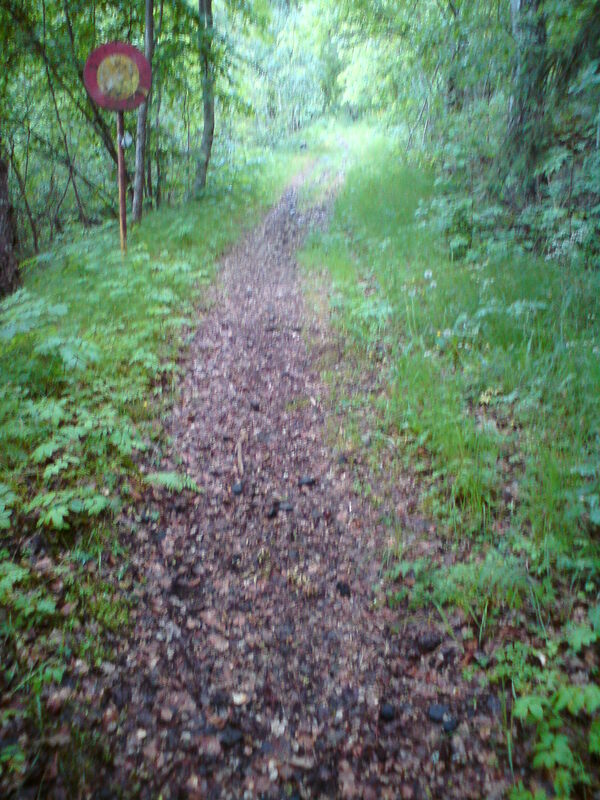 Easiest is to go to Flo klev and when the road turns right you will find a track to the left. 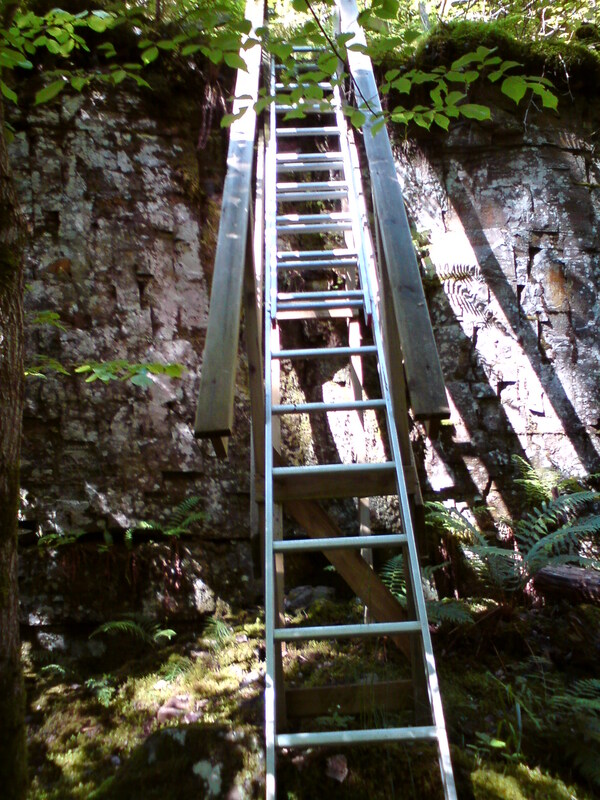 Follow it until you have a good track to the right and you will find the ladder. 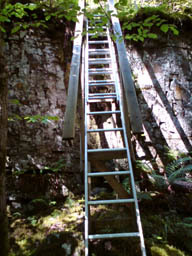 After the ladder people go to the left, but the klev was once possible to ride up, which is only possible to the right of the ladder. 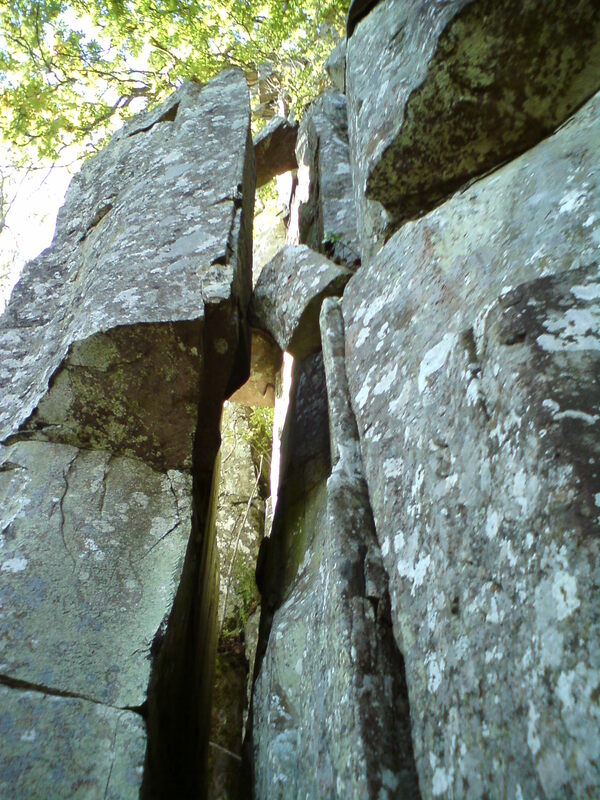 The beginning of the klev at the top is thus N58°20'22.37" E12°31'30.28"
28. Flo klev N58°20'46.47" E12°31'08.12"
Flo klev is the only road up to Hunneberg from the east side. This klev is called the Fox' step. It is probably Foxes who use it. You find it by going to Björndalen klev, then walk the road south to the next house. Continue yet 300 meters and you have the klev to the right. 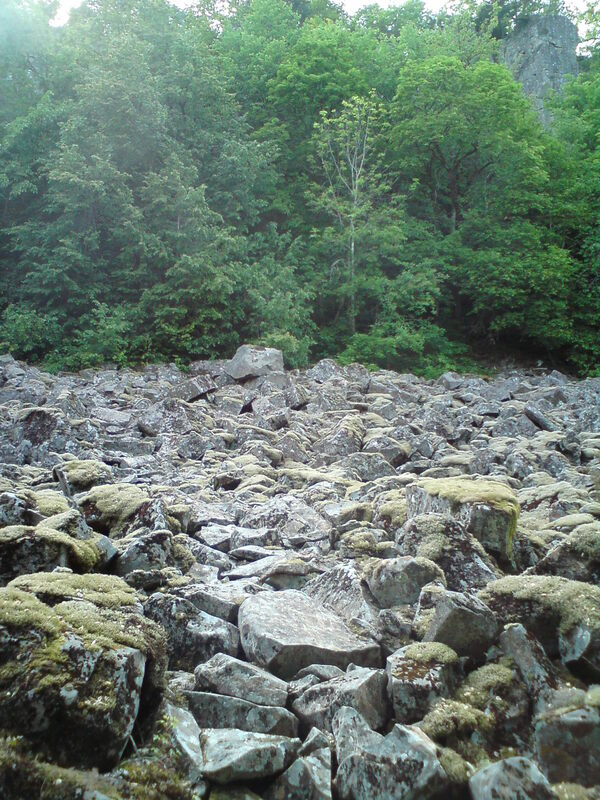 The klev is not easy to find, but this is a good direction: there are boulders below the steep, but at this place there is an area without boulders. Walk that way and when you reach the rock, keep to the left and shortly to the right upwards. 30. Hunneberg's Björndalen klev N58°21'26.99" E12°30'33.12"
There are two klevs called Björndalen klev. 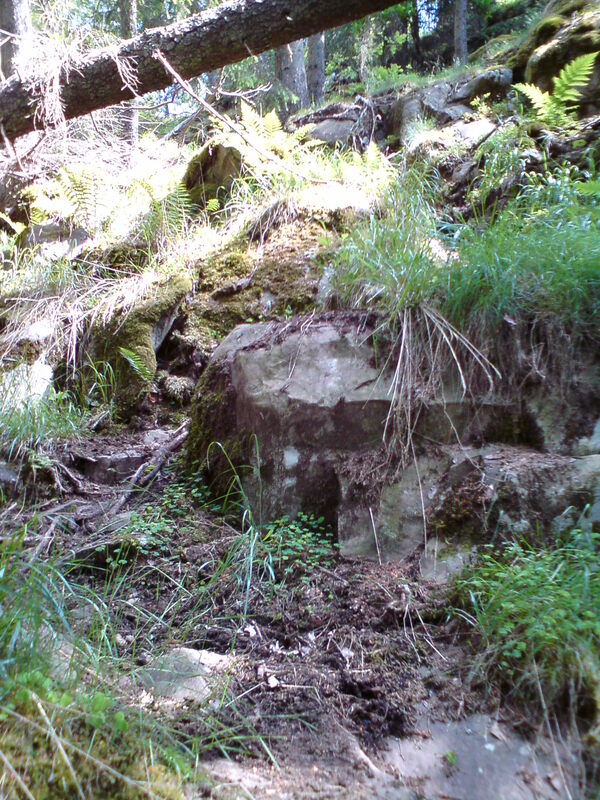 This one is on the east side of Hunneberg. Follow the road from Flo klev alng the plain. Take right to the mountain to Björndalen. There is a house where Björndalen begins. 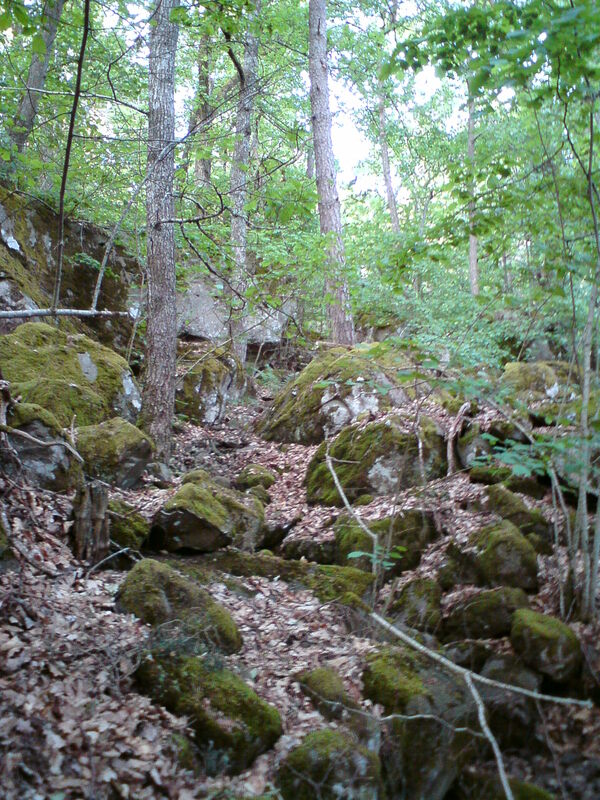 The track is west of the house. You will se a rope to take you up. This klev is on Hunneberg's north east corner. It is easy to go, but a bit trick to find the path. From below it is easy to find the start of the track, since it starts where the road between the montains turns east after having crossed tre railroad. Walk in an almost straight line from there and you will find the klev. A bit up you should keep to the left and slowly come closer and closer to the creak to the west. This klev was once the west end of the main road over Hunneberg. It starts at Erdalen and goes down to a cottage in the valley between Halle- and Hunneberg. There is one road and one track. Both are easy to use. It is easy to go straight over to Halleberg's Björndalen klev from here. 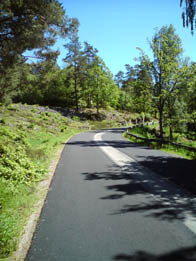 Bergastigen is an alternative track to Bergagården. It is easy to walk. 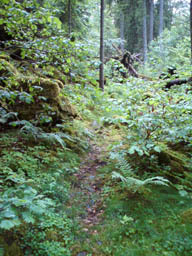 Travel towards By klev, but when the pasture ends and the forrest starts there is a road below the pastures. Walk this road. 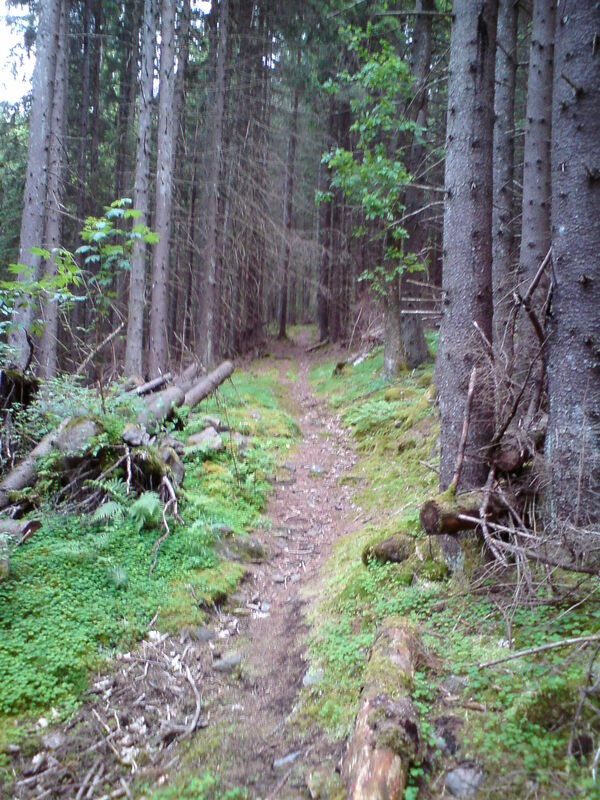 When you have Häcklan to the right the track goes downwards. Go 30 meters and you have a small path through the grass leading to a bridge. The track goes to the western ski pist and then straight south to Bergagården. 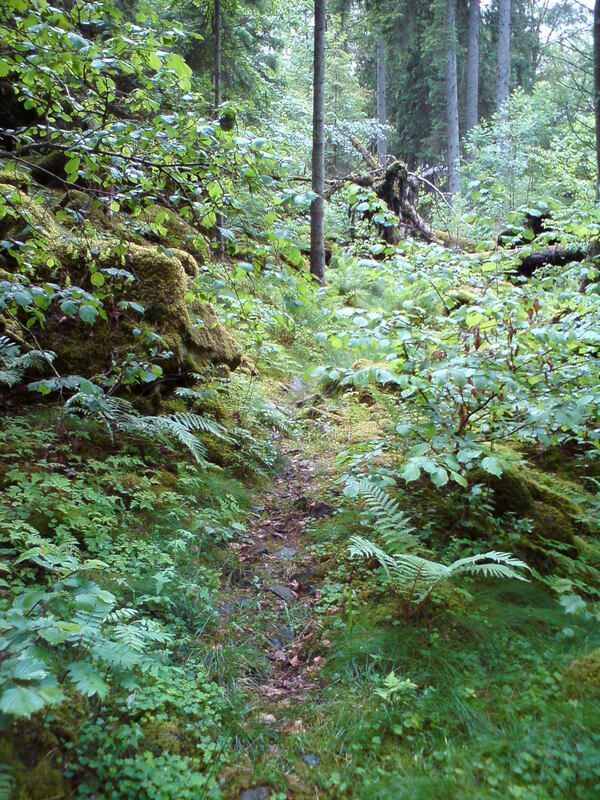 Russ Klev begins at a place called Härveden shortly after Häcklan on Halleberg. 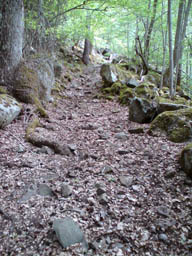 It is a path which is very easy to walk. 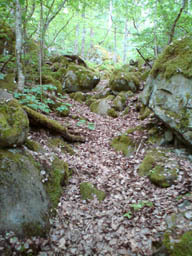 If you continue to walk you will walk in a valley with beeches. The valley continues to Storegårds klev. To find it take the road from Vargön between the mountains. Pass häcklan and then drive about 200 meters when you have two ski pists to the right. The track begins behind two yellow houses to the left. There are two klevs called Björndalen klev. This one is on the middle of the south side of Halleberg. 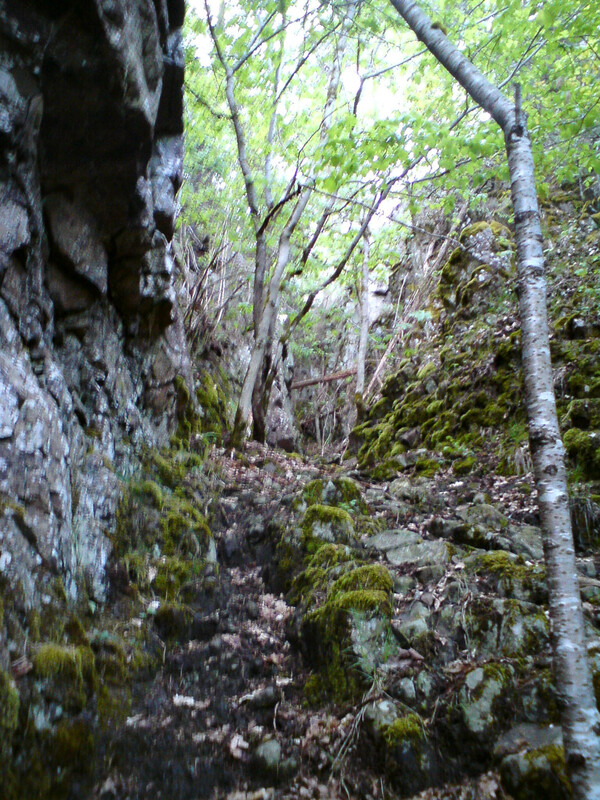 It is easy to walk up this way. A bit east of the start of the road is a house built in Swiss style, which was Oscar II's hunting lodge. A bit further east was Lilleskog's train station, where the king went of his train to hunt. This is a nice little klev on Halleberg's south east corner. To find it drive out towards Vänersnäs. Take the first road to the left. Continue until the road turns right while another bad road continues straight and a bit upwards. At this very spot the track starts. The track goes behind a house and then turns left. This nice little klev is actually much steaper than the picture can tell. 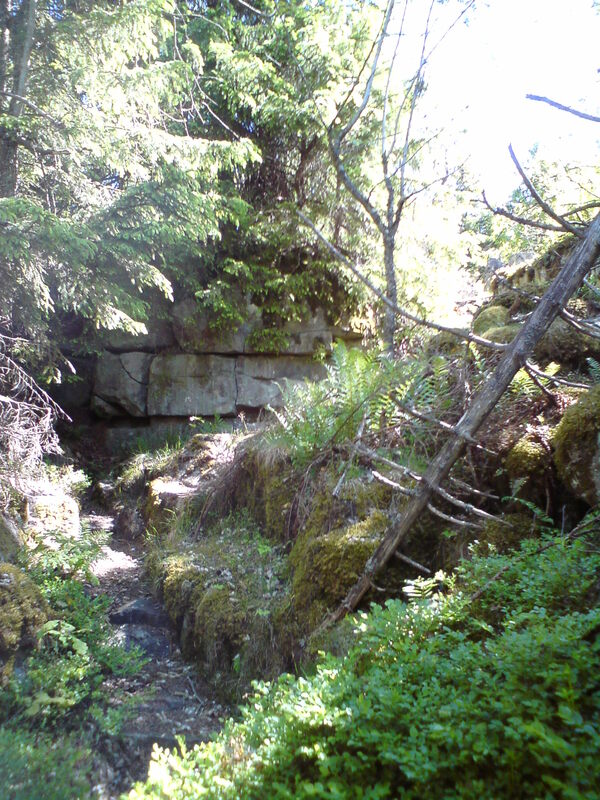 It goes in a ravine about 100 meters north of Maja Lise klev. Maja Lise klev and Bäcke klev lay above a coople of houses. Bäcke klev starts just after the northern garden. 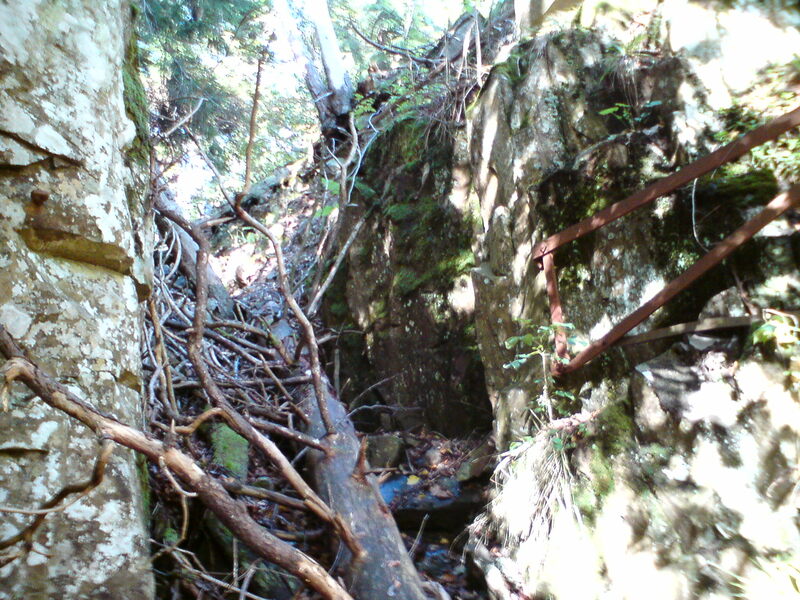 However it is a bit difficult to find the start of the track since a tree has fallen down and blocked it. 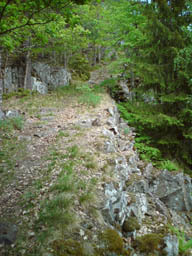 This klev is the main track up on the eastern side of Halleberg. It passes some mines and goes up to lake Hallsjön. 39. Jakobs stege (Jacob's ladder) N58°23'43.60" E12°28'10.37"
It is also called Fläske klev after a cave called Fläskeboa about 15 meters south of the klev. It is very difficult to reach the place where the ladder once stood and impossible to reach the top without a ladder. The name means swell klev, at least that is what I think, since you will here the waves of lake Vänern all the way down. Göran Söderström believes the name comes from Svall (a certain kind of ice in the winter). I think he is wrong. The klev is the eastern part of the valley separationg Hallesnipen from Halleberg. 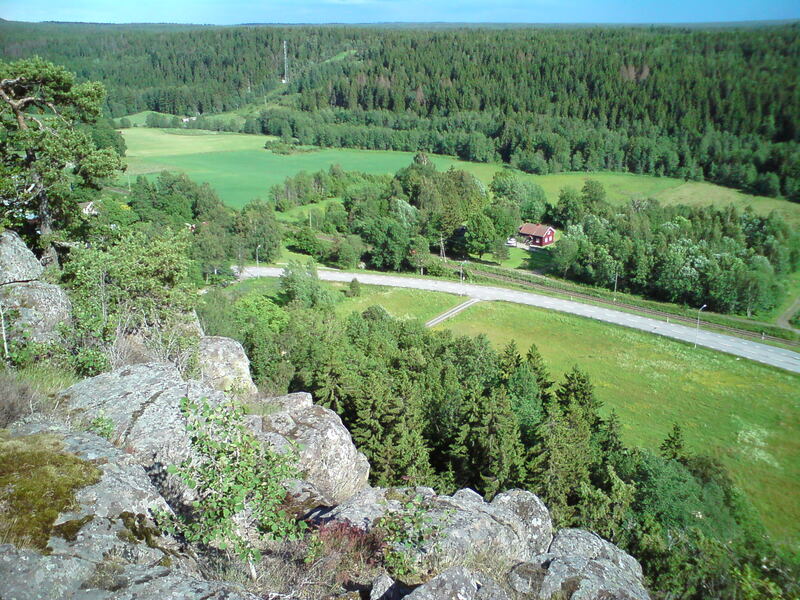 Ovandalen is the western part of the valley separating Hallesnipen from Halleberg. The klev is not called a klev, but in all practical cases it is a klev since it goes from Vänern up on the mountain. One track I come back to a couple of times each year is a track around Vrångevattnet north west of Uddevalla. Schematically it can be described as U with a lot of bays, in other words the lake has many corners and its namne means something like twisted lake. To walk around it takes an hour and is good for the heart since the track goes up and down a lot.